The Georgia State Department of Corrections groups all the states county and private prisons; transitional facilities, detention centers; parole and county jails under their jurisdiction. This includes the state's 26 state prisons such as Arrendale State Prison, Central State Prison, and Jimmy Autry State Prison, as well as federal facilities like the Federal Correctional Institutions at Jesup and Atlanta. Altogether, there are 13,004 correctional officers in the state of Georgia and the Bureau of Labor Statistics predicts that this number will increase by a steady 5% to 13,654 by 2022. Not included in this tally are significant factors such as jobs opening due to retirement, attrition, and promotion. The median salary for a front line corrections officer in the state is approximately $31,108 - opportunities for growth and advancement are plentiful for willing candidates. 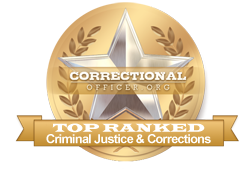 Interested in reading more about the corrections industry and where you might fit in? Read on for more information. Thomas University ranks first in our latest rankings with forty-two students graduating from programs in law enforcement administration out of a total 546 graduates. Columbus State University ranks second in our rankings with 220 students graduating from programs in criminal justice out of a total three thousand graduates in the 2012-2013 school year. Albany State University ranks third in our latest rankings with 91 students graduating from programs in corrections and criminal justice out of a total a thousand graduates. Southeastern Technical College ranks 4th in our latest rankings with 113 students graduating from programs in criminal justice out of a total a thousand students. South Georgia Technical College ranks fifth in our latest rankings with 124 students completing programs in criminal justice and criminal justice out of a total 2,412 graduates from the 2012-2013 school year. Fort Valley State University ranks 6th in our rankings with 58 students completing programs in criminal justice out of a total a thousand graduates from the 2012-2013 school year. Albany Technical College ranks seventh in our latest rankings with 225 students graduating from programs in criminal justice and security and loss prevention services out of a total 4,562 students from the 2012-2013 school year. Athens Technical College ranks eighth in our rankings with 163 students graduating from programs in criminal justice out of a total three thousand students from the 2012-2013 school year. Georgia Military College-Distance Learning Campuses ranks ninth in our latest rankings with 102 students graduating from programs in law enforcement administration out of a total 2,418 graduates. Southern Crescent Technical College ranks 10th in our latest rankings with 108 students completing programs in criminal justice and criminal justice out of a total 2,784 graduates in the 2012-2013 school year. Wiregrass Georgia Technical College ranks 11th in our rankings with ninety-two students completing programs in criminal justice and criminal justice out of a total 2,440 students from the 2012-2013 school year. Georgia Northwestern Technical College ranks 12th in our latest rankings with 148 students graduating from programs in criminal justice and criminal justice out of a total four thousand students from the 2012-2013 school year. Augusta Technical College ranks 13th in our rankings with 93 students completing programs in criminal justice and criminal justice out of a total two thousand graduates in the 2012-2013 school year. Savannah State University ranks fourteenth in our latest rankings with 31 students graduating from programs in corrections out of a total 928 graduates from the 2012-2013 school year. Georgia Piedmont Technical College ranks 15th in our latest rankings with ninety-seven students completing programs in criminal justice and criminal justice out of a total 2,928 students from the 2012-2013 school year. Clark Atlanta University ranks sixteenth in our rankings with thirty-nine students graduating from programs in criminal justice out of a total a thousand students in the 2012-2013 school year. Columbus Technical College ranks 17th in our rankings with 63 students graduating from programs in criminal justice out of a total two thousand students in the 2012-2013 school year. Coastal Pines Technical College ranks eighteenth in our rankings with 39 students graduating from programs in criminal justice and criminal justice out of a total 1,564 graduates from the 2012-2013 school year. Ogeechee Technical College ranks nineteenth in our rankings with fifty-eight students completing programs in criminal justice and criminal justice out of a total 2,420 graduates. Valdosta State University ranks 20th in our latest rankings with 116 students completing programs in criminal justice out of a total five thousand graduates from the 2012-2013 school year. The Department of Corrections reserves the right to test applicants for drug use, and background and character checks as it deems appropriate. Finally, applicants who meet all the academic and physical requirements will be scheduled for additional training at a state Department of Corrections facility in order to complete hands-on training that is key to success on the job. Candidates who are not successful in this endeavor will not be hired for the position of corrections officer. The state Department of Corrections in Georgia encourages stability in the field of corrections by supporting careers in state service, namely as front-line correctional officers. At this time, the median income for correctional officers throughout Georgia is lower at $28,000 than the national median income at $39,800, however, professional development for existing officers helps remediate the lower starting salary. and according to occupational data for the state of Georgia, available at http://www.careerinfonet.org/occ_rep.asp?next=occ_rep&Level=&optstatus=011000000&jobfam=33&id=1&nodeid=2&soccode=333012&menuMode=&stfips=13&x=28&y=16 and published by CareerInfoNet.org, state trends are predicted to experience a decline from now until 2022 as compared to the national growth rate of 5%. This predicted pattern translates into 470 less employees per year. The table below lists career information collected by the Bureau of Labor Statistics for correctional officers in Georgia. The table is sorted by total employment, with the largest metropolitan areas listed first.